SynapseIndia delivers a perfect combination of software development and web design services covering nitty-gritty elements like template design. Web design has lately become critical to the growth and expansion of businesses. This is especially important for small and medium-size businesses operating in a competitive business landscape. Web design is forms the central machinery of a digital marketing strategy. As access to mobile computing devices becomes easier and less expensive, the popularity of websites as a marketing tool will only increase. Every modern-day business faces a constant shortage of time. Whether its daily operations or marketing time is always scarce. Therefore, by choosing the right web design services, businesses can achieve their operation-related goals. If the digital marketing strategy isn't optimized for mobile devices, you're most probably missing out a large group of customers. Responsive web design is the solution when it comes to targeting mobile users through digital marketing. Smartphones are apparently bound to become the most dominant computing device in the world. Therefore businesses cannot take the risk of avoiding this large chunk of customers. SynapseIndia has a team of creative designers who use technologies like HTML and NodeJS to create captivating designs. They are focused on making designs that are not just visually great but also bring financial benefits to the clients by prompting a higher conversion rate. 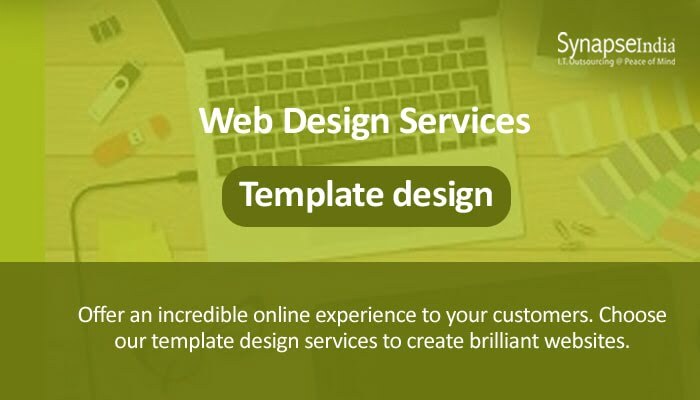 The template design services, for instance, make it easier for businesses to own a website that exhibits all the characteristics of a flawless design.